Golden seared scallops and juicy pan-seared filet mignon! Before you begin set your meat out so that it comes to room temperature. Before you are ready to cook, take your scallops out too. Remove them from the packaging, drain any fluid. Set them on a plate and pat them dry. Do the same thing with your steaks. Set a 12″ skillet on your largest burner over medium heat. While it comes to temperature salt the filet mignon with 1/2 a teaspoon salt, 1/2 teaspoon garlic powder and all of the white pepper, onion powder and rosemary. Set aside. Season the scallops with remaining salt and garlic powder and set aside. Put the bacon strips in the skillet and cook 4-5 minutes a side until crispy. Remove the bacon from the skillet and set aside, leave the bacon grease in the skillet on the stove. Place your steaks in the skillet and cook undisturbed for 4 minutes. Then slip over and cook for 3 minutes. Finally, use tongs to lift the steaks and give the short sides a sear all around. Total cook time 8 minutes. Set the steaks to rest on a cutting board. Quickly add the scallops to the skillet, flat side down, with none of them touching. Sear 6 minutes without moving then flip over and sear another 3 minutes. Promptly remove from the skillet and serve with the filet mignon. Chop up the bacon and sprinkle over the plates! If you’re making the broccoli I would put that in the oven well before cooking the steaks and scallops, as the broccoli takes 40 minutes and you can always turn off the oven and leave it in there to keep it warm. Another tip is to place the steaks in the warm oven until you’re done with the scallops. If you’re making the pan sauce, make sure to have the broth, garlic and cashew cream ready to go before you start cooking, it comes together in 3 minutes, right after you take the scallops out of the skillet. Want to keep it super simple: serve with some fresh arugula, lemon and olive oil. 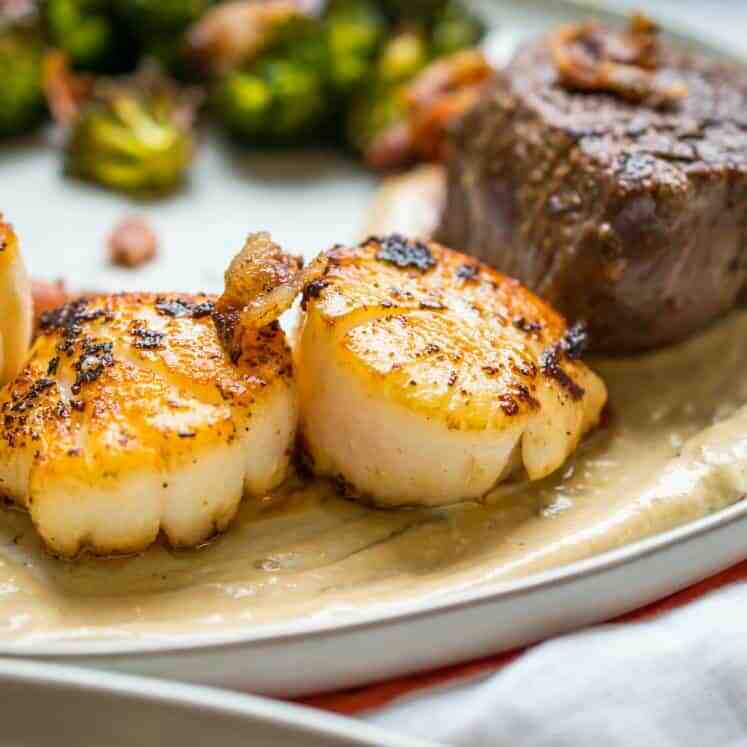 The filet and scallops are the stars here and truly don’t need any dressing up!